Three people were hospitalized on Sunday after a pickup truck slammed into a pole in Brunswick. Three people were hospitalized on Sunday afternoon after a pickup truck slammed into a pole in Brunswick. 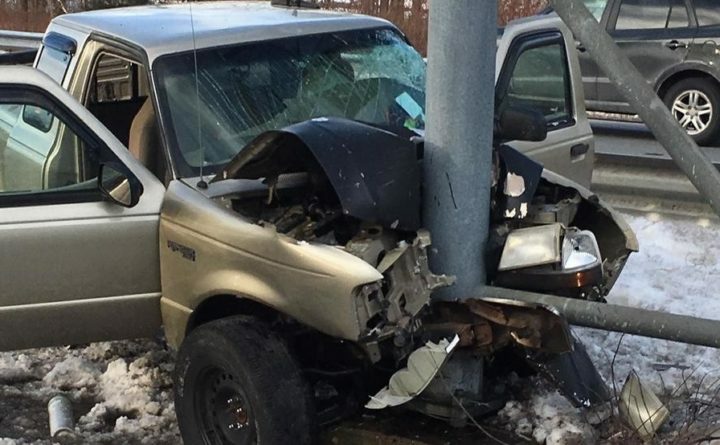 A Ford Ranger was traveling north on Route 1, near the Route 196 connector, about 2:45 p.m., when police say the truck left the road and struck a large pole, according to CBS affiliate WGME. The truck’s driver, a 49-year-old man from Dresden, and his two passengers, a 22-year-old woman from Dresden and a 24-year-old man from Topsham, were taken to Maine Medical Center in Portland with “very serious injuries,” WGME reports. None of the individuals in the truck have been identified. Brunswick police closed both the northbound and southbound lanes of Route 1 while they investigated the crash. Police have not yet released a cause for the crash.